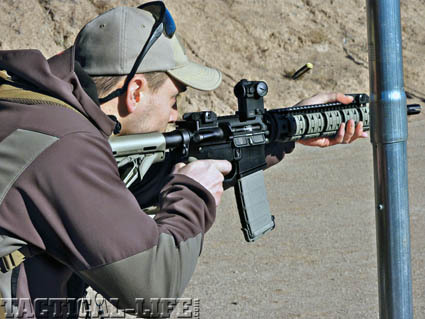 Former Army Ranger Tim Abell shreds with the 5.56mm LMT MRP with a SureFire Vertical Foregrip WeaponLight. Okay, the British rockers Dire Straits were not singing about my favorite black gun, but they could have been, because, since the rise of the modern combat rifle with the U.S. Army’s adoption of Eugene Stoner’s ArmaLite AR-pattern rifle in the 1960s, it has become the most modified, enhanced, vilified and flat-out desired rifle in world history. The magazine-fed battle rifle had been kicking around since the early 20th century, and development really kicked up in the 1940s with Germany’s MP44 (the direct progenitor of today’s Heckler & Koch roller-blocked rifles) and Russia’s AK-47, but those were foreign rifles. It was during the conflict in Southeast Asia that the U.S. military finally embraced the concept of a lightweight rifle that fired a lightweight, high-velocity round as a battle rifle. 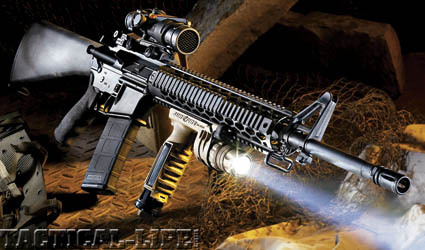 While combat rifles had historically been made of steel and wood, the new black rifle designs allowed the use of light materials, like aircraft-quality aluminum for the receivers, with steel relegated to fire control group internals and barrels. The poster boy for this modern battle rifle was the one that began replacing the M14 in 1962—the Colt M16. Let’s look at that 1960s-era issue M16 so we can see just how far it’s come. The M16A1 featured an aluminum upper receiver with a molded-in carry handle that housed the rear sight. The forend was a two-piece plastic triangular affair with a hollow, plastic buttstock and pistol grip. It weighed 6 pounds when loaded, was fed by a 20-round box magazine and the barrel had both a prong flash suppressor and a 1-in-14-inch twist bore—which wasn’t enough to stabilize the 55-grain ball ammunition it was issued. Almost immediately, improvements were heaped onto the M16 platform. It got a chrome-lined barrel, making it less likely to corrode in the damp jungles of Southeast Asia, with a faster twist rate. A variant short barrel, the XM177E2, was coupled with a collapsible stock. A “forward assist” was added on the ejection port side of the receiver that could be slammed by the heel of your palm to make sure the bolt was fully seated in the chamber. The prong flash suppressor that caught on foliage was replaced with one that resembled a birdcage. A round, ribbed handguard replaced the triangular one. The Colt rifle, now known as the M16A2, was beginning to rock. Once the M16 and its semi-automatic civilian brother, the Colt AR-15, had gotten traction with American gun owners, there was nowhere to go but up. Every mother’s son wanted one, and every accessory and optic manufacturer wanted to make products for it. The ultimate sign of success of our home-grown black gun? Today, with the exception of England and France with their military bullpups, most of the major gun manufacturers of Europe, including HK, Sig Sauer and FN, are all making variants of “our” AR rifle. Mossberg has a centerfire AR rifle this year, the MMR Tactical. You heard me: Mossberg. From Remington to Ruger to Sig Sauer and Smith & Wesson, every major gun company has joined the original AR manufacturer Colt and now has at least one black gun in its lineup. And they’re offering this gun in every level of trim, from full-blown SASS (Semi-Auto Sniper Systems) to Realtree camo-dipped deer rifles. Add to that the number of AR-specific rifle manufacturers, like ArmaLite, DPMS Panther Arms, LaRue Tactical, Daniel Defense, Lewis Machine & Tool (LMT), Addax Tactical, and you’ll know why black rifles have been the number one item on everyone’s shopping list. But what does the AR rifle look like after 40 years of evolution? For starters, the primitive carry handle mount of the original M16 is gone, and it is now standard for ARs to come with flattop receivers featuring built-in Picatinny rails and handguards along the barrels. Many, like LaRue’s OBR and LMT’s MRP have monolithic upper receivers that are integral with the forend, giving the operator top rails that extend from the rear of the receiver right out to the gas block. These rails allow easy mounting of optics (day and night vision), lasers and tactical lights directly to the rifle without clumsy adaptors. The A2 fixed and CAR telescoping buttstocks have been improved with the infinitely more comfortable and versatile stocks like the SOPMOD from LMT, the Magpul UBR and Vltor EMod, most available in black, green or tan, and all featuring battery compartments for extra weapon light and optics batteries. 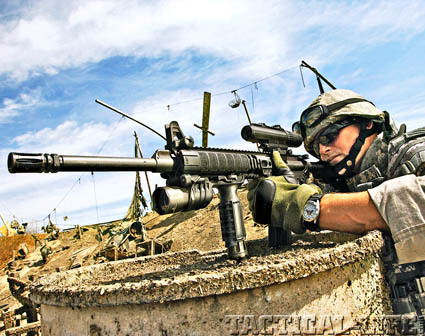 Tactical marksmen can even opt for the Magpul PRS Precision Rifle/Sniper stock. One of the biggest changes lies under that forend rail system of your new black gun. Stoner’s original design was for a gas system that fed gas bled out of the barrel back through a tube into the receiver, directly into an expansion chamber in the bolt carrier. The expanding gas forced the bolt back to eject the fired brass while the recoil spring housed in the buttstock tube returned the bolt to battery. The gas system of choice in these new black rifles, such as the HK416, is a short-stroke gas piston. No longer do the propellant gases have to travel all the way back into the receiver. They merely push back on a piston rod that travels a short distance and impacts on the bolt carrier group. Gas piston proponents believe this is a superior system because less propellant gases and fouling go back into the receiver, letting the gun run “cleaner and cooler.” Gas-piston detractors point out a few downsides: the additional piston is heavier, and accuracy and wear issues arise from the bolt carrier tilting as it is struck off-center by the piston. In spite of these arguments, almost all the latest model black guns feature some version of this short-stroke piston. But while S&W, LMT, LRWCI, POF, Remington, Sig Sauer and Ruger are making their gas piston guns from the traditional M4 blueprint, we also have rifles hitting the market that are seeking to improve on the AR platform. The first of these, Robinson Arms’ excellent XCR, has been joined by the Bushmaster ACR and FN’s SCAR Light and Heavy. These rifles use the issued AR magazine and the basic fire control ergonomics of the AR rifle while pushing the design with polymer receivers, left-handed bolt handles and folding stocks that are made possible by housing the recoil springs and gas piston inside the handguard, like the old ArmaLite AR-180 and FN’s 5.56mm FNC. Trying to give the shooter the most adaptive black gun, these new designs include interchangeable barrel/caliber options so the operator can go from a short 14-inch entry gun to a 20-inch-barreled squad marksmen’s rifle. Soldiers who had trained on the M1 Garand’s eight-round en bloc clip must have thought the 20-round magazine that came with the M14 rifle was manna from heaven. The same went for sportsmen back home who were used to three-round-capacity hunting rifles. That gray aluminum magazine that came with my first Colt Sporter in 1979 held an entire box of .223 ammo! Thirty-round magazines, nicknamed “banana clips” because of the curve of their stamped aluminum and steel bodies, quickly joined the 20-rounders. But it didn’t stop there. AR owners realized that they could increase capacity by taping two magazines together. Then manufacturers started offering clips to hold two magazines together. 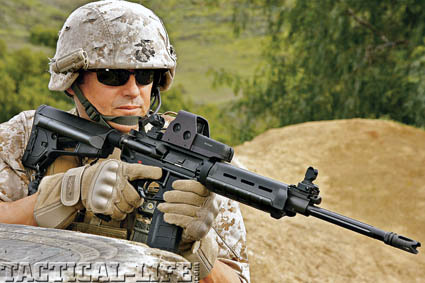 The creation of the Beta C-Mag, two 50-round drums that feed into a center column and give the M16 a 100-round capacity, upped the ante even further. From those original, throwaway aluminum GI-issue magazines came the higher-quality metal magazine. I remember my first steel-bodied 30-rounder. It didn’t feel like I could crush the magazine in my hand. Today there are as many choices in magazines as there are in guns, with Teflon-finished bodies and no-tilt followers to ensure reliable feeding. Fusil-USA offers shooters 30-rounders with one-piece steel MIG-welded bodies and flawless feeding. Custom gunsmith Dave Lauck has his own Extreme Duty magazine that carries a full money-back guarantee from D&L Sports. While many states now restrict detachable magazine capacity to 10 rounds, those lucky enough to live in free states can even buy the SA80 magazine made by HK, which many elite combat and police units consider to be the best AR mag on the market. The 30-round SA80 features a steel body and follower, advanced springs, a Marine-corrosion-resistant finish and a $50 price tag. With the proliferation of these metal mags for black guns also comes a flood of high-quality polymer magazines like Magpul’s PMAG, TangoDown’s ARC and Lancer’s AWM. Some of these magazines even feature clear viewing ports so the remaining rounds can be eyeballed in battle. And, for those whose line of work can lead to a protracted firefight, tactical flashlight manufacturer SureFire has just introduced two super magazines—the MAG5-60 and MAG5-100, with capacities of 60 and 100 rounds, respectively, in double-wide aluminum bodies designed to fit in some existing web pouches. The 5.56mm NATO rounds going in those magazines are better than ever. The 55-grain service load was upgraded to the 62-grain SS109, and while current troops are issued the M855A1 green-tipped “lead-free” ammo, civilian 5.56mm AR owners can get premium commercial loads from Black Hills 50-grainers to Hornady 60-grain tactical loads to Silver State Armory ammo topped by 77-grain Sierra OTM bullets. For specialized long-range guns, there’s even special match ammo with 80-grain weights. Speaking of ammunition: Prices have been rising like gas at the pump, so many are turning to .22 LR as an alternative. 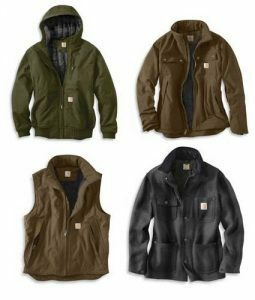 While S&W and Sig Sauer are offering .22-caliber replicas of their full-size guns with the M1522 and SIG522, Remington, Ruger and Mossberg offer “dressed-up” versions as well: The Remington Model 597, Ruger’s 10-22 Carbine and Mossberg 702 semi-auto .22 rifles are designed to ape the pistol-gripped appearance of the M16/M4. Scope companies now have lines of telescopic and red dot sights designed and marketed specifically for the black gun sportsman. Many of these scopes have the letters “AR” built into the model number or printed right on the tube. In traditional configuration, Leupold has added to their excellent Mark 4 tactical line with the AR series of scopes with zoom ranges from 1-4X up to 6-18X, with bullet-drop compensation and mil-dot reticles. Burris has their XTR and TAC30 tactical scopes, Nikon has the M-223 series of scopes designed around the AR’s 55-grain bullet performance, and Bushnell has their Tactical Elite scopes. 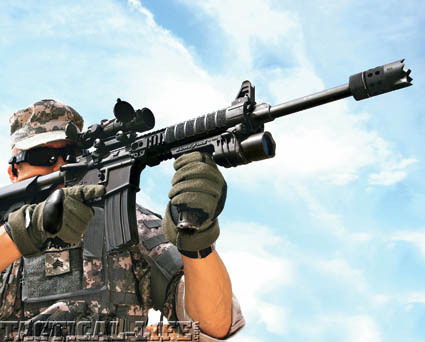 For fast shooting with both eyes open, many shooters are putting red dot scopes on their rifles. The manufacturers have responded with a plethora of red dot options, from Trijicon’s mega-buck ACOG to Leupold’s CQ/T and HAMR and the military-issue Aimpoint Comp M4 series. Many of these high-tech optics leave out the scope body entirely for a “heads-up” reflex display—optics like the original C-More, EOTech, MRDS mini-red dot and Leupold’s new DeltaPoint. Some tactical operators and competitive shooters will mount a traditional scope on their rifle’s top rail, and a second mini red dot offset on the side of the receiver, turning the gun sideways and using the smaller reflex sight for close-range targets. Since the sunset of the Federal Assault Weapon Ban in 2004, the market for civilian versions of these black guns has exploded. The primary area of expansion has been in the calibers available to BR shooters. 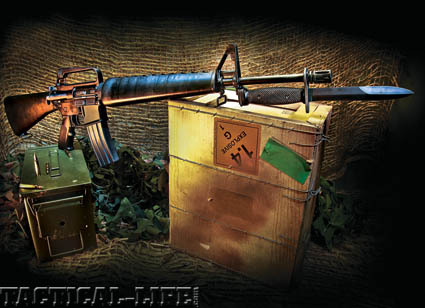 Going all the way back to the creation of Eugene Stoner’s original AR-10s, .308-caliber rifles now for sale include Bushmaster’s ORC, KAC’s SR-25, Remington’s R-25, LMT’s LM308MWS, LaRue’s OBR and the DPMS Panther LR-308. 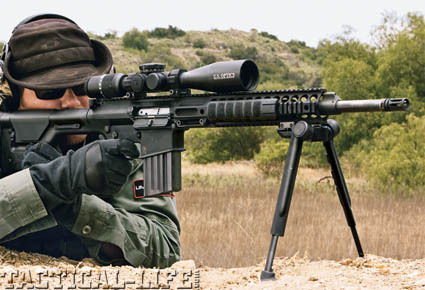 But the choice of 5.56mm and 7.62mm ammunition was not enough for the black rifle crowd. One of the biggest benefits of the AR platform is that with a new upper receiver (and sometimes a new bolt carrier group) the rifle can change to a new caliber. 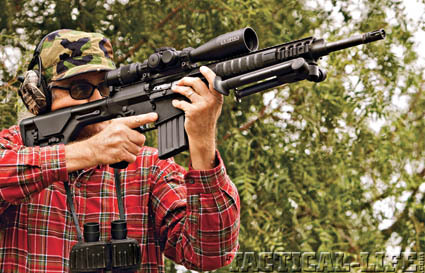 LMT goes one step further with their interchangeable-barreled LMT CQB MRP. With a supplied torque wrench, the direct impingement 5.56mm barrel can be quickly removed and replaced with a 5.56mm gas piston barrel without having to remove any optics or accessories mounted on the monolithic railed upper. Likewise, that gas-piston barrel can be replaced by an 18-inch stainless direct impingement barrel in .204 Ruger or a 12.5-inch 6.8 SPC barrel in either direct impingement or gas piston variations. LMT’s .308-caliber MWS will also soon be able to change to other calibers that fit the overall length of the MWS magazine like the .243 Winchester and .260 Remington. The modern AR rifle can be found chambered in dozens of standard SAAMI calibers and wildcats from .22 LR to 9mm, and 6mm PPC to .300 Whisper (now AAC Blackout). Think the black gun is versatile enough? MGI’s Hydra QCB weapon system features a modular magazine well that allows the operator to have just one rifle that can be chambered for .223, 7.62x39mm, 6.8 SPC, 6.5 Grendel, .50 Beowulf and .45 ACP. I have fired the MGI on full-auto in .45 and it created a beautiful brass rainbow. I also own the LMT MRP with all of its caliber conversions and must admit that it is comforting to know that there are second, third, or seventh calibers to use as ammunition sources dry up. Now that the black gun has found its way into every gun owner’s safe, they’re also finding themselves in places they’ve never been before. While ARs have been stalwarts at service matches like Camp Perry for decades, they have also helped create the new 3-Gun craze. In 3-Gun matches, competitors must run the course using a rifle, pistol and shotgun. Multiple targets are engaged in various scenarios at distances from point blank to 400 yards, and the winners must be accurate and fast. 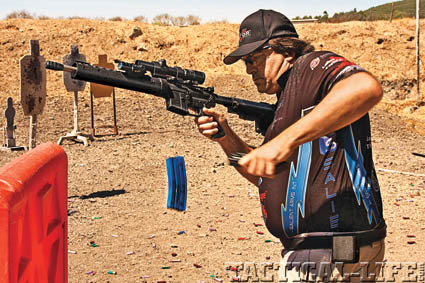 The go-to gun for the rifle stages is a highly modified 5.56mm AR like the one used by multi-time Tactical Class National Champion Taran Butler. His personal gun is a Bushmaster M-15 that features a Vltor Muir Upper receiver, a PRI tube handguard and muzzle brake designed by Butler, and a Trijicon 1-4X Accupoint. With a gas port tuned to his ammo, this gun kicks like a .22 LR and is deadly accurate with rapid follow-up shots. From the gaming field to the game field, with cartridge chamberings that can now reliably take deer and other large game, the black gun has become the camo gun, with a whole generation of hunters embracing this semi-auto for all hunting seasons. 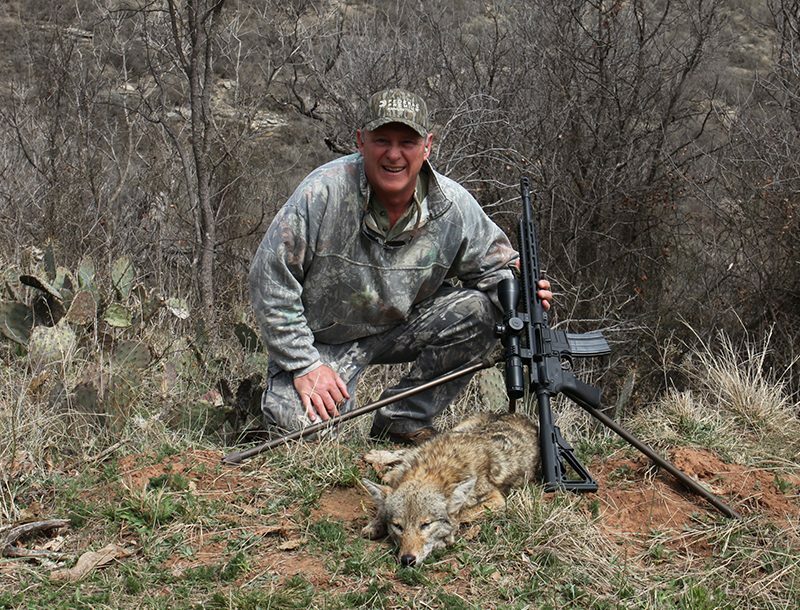 These rifles, like Remington’s Mossy Oak-finished R-15, are stripped of many of the military features like forend rails systems and flash suppressors, giving the hunter a “politically correct” repeating rifle for the 21st century. From its humble beginnings nearly 50 years ago, the black gun has matured into a super performing, multi-purpose platform with a nearly infinite list of modifications, optics and accessories.